Dec 21, 2015 We appreciate your sharing this experience with us and we were glad to get this resolved. As you now know, your father was not charged for the vacation he initially booked on-line because the reservation was never processed nor finalized. All of BookVIP’s special-rate promotion packages are sponsored by the participating resort provider, who also subsidizes these packages in order to provide amazing vacations to all who are eligible under the Terms and Conditions for the promotion. The Terms and Conditions (including age requirements) are located at the bottom of each resort/hotel offering page on BookVIP, are reviewed with every potential customer by the sales agent, and then must be accepted and agreed to in writing by a customer before any reservation can be finalized. 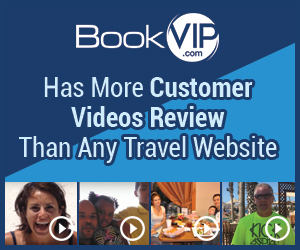 Upon receipt of your review, one of BookVIP’s supervisors contacted you for more details and then worked with your parents until a reservation was made at a beautiful 5-star resort of your parents’ choosing on their preferred travel dates. BookVIP’s main goal is to provide excellent customer service to every customer, resulting in the most awesome vacation experience available under the guidelines set forth by our participating resort partners. We send over 100,000 people on vacation per year and have more customer video reviews than any other travel site. http://bookvip.com/sitereviews. This company is not a standup company. They advertise specials and after my father purchased and paid for the vacation they informed him, during the post pay phone call, that since he is 70 years old he did not qualify for the special. WHAT? That is ridiculous, older adults are often the people who want to purchase a timeshare because they have the money to buy it and the time to visit. How tacky. i would not recommend getting involved with a company like that. Review #747981 is a subjective opinion of Kellysm4.